Macchu Pichu celebrated its 100th anniversary of being discovered by the western world on July 24th, the exact day we visited. We didn’t know that until we got there, and we didn’t really belive the tour guide, but Wikipedia agrees so it must be true. Ok, I’ve gotten ahead of myself, let me step back. How to get to Macchu Pichu? 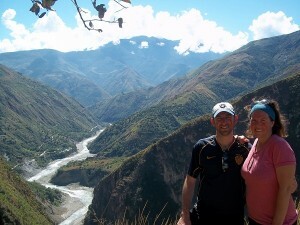 There are a couple options, 3-4 day Inca trail, adventure jungle trip, or bus directly there. The obvious decision here is adventure jungle tour. Two days later the bus picked us up, with 8 other people and we were on our way. The first leg of the adventure tour was a downhill bike ride. Almost identical to the death road, just fewer drop-offs. We zipped down the mountain taking off-road short cuts and stopping for the beautiful views of the valley below. I was having way too much fun to take pictures. The first day came to a close with a soccer match. There were people from Argentina, Brasil, US, Peru, Israel, Australia, and England. The Brazilians were heads and shoulders above everyone else. Leah and I watched the matches, along with much of the small town. Our second day started with a half hour ride in a cattle truck. It was a lot of fun, and the 20 of us on back had a great time making farm animal noises at people we passed. I’ve included a short video of everyone. We spent the rest of the day hiking up beautiful mountains with views of a river and valley below. We walked through fields of coffee shrubs, coca plants and banana farms to a house with breathtaking views of the valleys below. We had a short lunch there with freshly squeezed fruit juices, the guides talked about local plants, and painted everyone’s face with red dye from a local plant. The last part of the day we hiked on the original Inca Trail. The tour guide gave us a short history lesson on the Incas from rise to fall. His history and the history I’ve read about the Incas was a little different, especially when it came to the fall of the Incas and how 125 Spaniards conquered 30,000+ Inca warriors. It’s always interesting to hear different stories. The third day was by far the most exciting. In the morning we went zip-lining. There were 6 tracks in total and it was amazing, the views were spectacular we felt like birds flying through the valleys. I’ve included a video of one of the zip lines. After the zip lines we drove to our next hiking spot. The roads in Peru in general are way too narrow. They all seem like one way streets, but they are intended for two way travel. This never was much of a problem until this day. We had 2 vans full of people and suddenly we stopped, head to head with a construction truck. According to skinny road etiquette the construction truck should have backed up and let us through, they didn’t want to. Our drive got out to ask them what was going on and the construction truck driver started shouting and abruptly opened his door, smashing it into our driver’s nose. Our two vans emptied instantly, and the construction driver found himself face to face with 12 very angry Brazilans, and Irishmen. (Irishmen always seem to find a fight) He second guessed his rash decision and immediately started backing up his truck. Our driver was alright, and everything ended up just being a little extra excitement for our trip. We spent the evening in a hot springs. The hot water was a blessing, we were knackered from the hike. 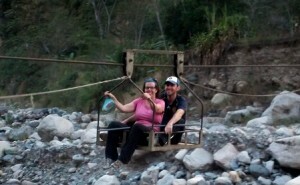 The tour ended in Aguas Calientes. It is a tourist town at the base of Macchu Pichu. From this town you can take a bus to Macchu Pichu or you can walk up nearly 1000 steps to the entry gate. All the tours end in this city whether you take the Inca Trail, the Jungle Trail, or the train from Cusco. We explored the town, checked out the markets and had a bit to eat before taking a nice long, hot shower. The first shower since we left Cusco. The next morning I got up at 4 am to start the walk up the 1000 steps. Leah decided she’d take the bus and meet me at the top. I met with a couple other guys and we were a group of 6 when we started the ascent. The weather was perfect, and the sky was clear. The moon and stars gave us enough light to walk up the steps with ease. About half way up the steps our group of 6 had dwindled to just a Brazilian guy and me. We walked together and tried to take in everything on this amazing walk. We stopped a couple of times to look at the mountains around us. It took about an hour to get to the top and we were one of the first at the top. We waited in line and when Leah got there by bus we headed into the park. 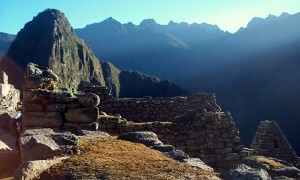 The first glimpses of Macchu Pichu were sureal and tranquil, there were very few people there so early in the morning. 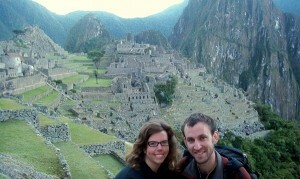 We took a couple of the cliché Macchu Pichu pictures before hunting for a spot to view the sunrise. The sunrise was spectacular, the rays of light lit up the mystical ancient city and we were mesmerized. It was a much anticipated moment, after 3 days of hiking through the forests, we had many hours to envision this moment. 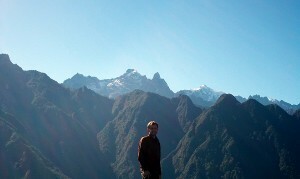 After taking in as much as we could, we walked over to Huayna Picchu, the mountain that overlooks Macchu Pichu. This hike was very difficult. About 1 1/2 hours of steep steps and breathtaking views. There were ledges with stunning panoramics of the ruins. The views put the splendor of this city into perspective.